Your table linens add color and elegance to any event, and your napkins, in particular, can be lovely accents to any table setting. 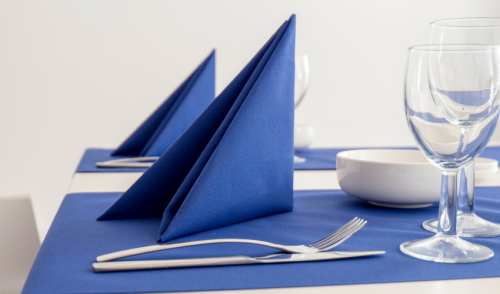 While the color and fabric of the napkins automatically provide extra flair to the table, it is the folding that can really make a napkin stand out as a focal point for each place setting. You don’t need to be a textile expert or fabric artist to fold lovely napkins, however, and these designs can be fabulous options for any event. If you’ve never folded napkins before, simpler designs with fewer folds or more forgiving arrangements will be the easiest to manage. Flatter designs are easier to keep looking their best, while upright designs can be more of a challenge. It can be helpful to experiment with several different folding patterns to see which suits your folding skills, napkin type, and event style best. Pocket Fold A very simple, straightforward design that gives the napkin a pocket, this fold can be done in seconds, lays flat, and is ideal for any type of event. The pocket can be used to hold cutlery, place cards, a menu, or a decorative accent such as a small floral stem, feather, or herb sprig. Variations can include multiple pockets on the same napkin, or either straight or angled folds. Rosette Fold Also called a rosebud or rose fold, this is more of a rolling technique than straight folding, and gives a nice, compact floral shape. Depending on how the initial folding is done, the rosette may or may not have a leaf or two at the base. This is a great option for smaller place settings or when using multicolored linens to really add dimension to the rose design. Fall Leaf Fold For an autumn event, a jewel-toned napkin folded into an elegant leaf shape adds a bit of natural beauty to each place setting. This design incorporates soft pleats for dimension, and the stem of the leaf can be tied off with twine, raffia, ribbon, or a napkin ring. For a more elaborate design still reminiscent of leaves, consider the similar fleur de lis folding pattern. Bow Fold A simple design that mimics a formal bow tie, this fold is easy on any napkin size and is pinched together in the center with a coordinating ribbon or could be held with a small napkin ring. The bow could be pleated for extra dimension, or consider folding a classic necktie pattern for a more whimsical approach to this type of folded napkin. Fillable Pouch A more elaborate type of pocket fold, the fillable pouch fold provides a handy, upright container that can be filled with candy or nuts, a wedding favor, teabags, or a large flower bloom for added color. There are different shapes of pouches that can be folded, from simple boxes and cylinders to envelopes, cones, and vases, depending on the intricacy of the design. Classic Folds: There are many basic folds that can work for any event, including a candle, pyramid, cascade, spray, and fan. Each of these folds has different variations, some of which include both flat and upright shapes. These classic folds are ideal for any type of formal dinner, luncheon, or other event. Flower Folds: There are many variations on different types of rose folds, while the tulip and lily folds are other simple designs. For a larger place setting with a more elaborate flair, the lotus fold is an elegant choice. All types of flower folds are ideal for garden events, tea parties, or weddings. Beach Folds: Fun themes can always include folded napkins, and if your event is at a beach location, you can opt for a fish fold, sailboat, scallop, or other shell designs. This is a unique choice for beach weddings, pool parties, yachting events, or any other theme connected to the beach or water. Rustic Folds: Events with a rustic theme, such as barn weddings or more casual affairs, are a hot trend, and there are plenty of napkin folding designs that will work. Pinwheels are an elaborate and unexpected choice, or you can opt for more simple rolled styles or even a basic knotted napkin for an unusual table accent. Holiday and Whimsical Folds: There are many fun folding options that can work for any holiday event. Hearts, bunnies, Christmas trees, four-leaf clovers, and turkeys can all be fashioned from napkins, or consider a diaper fold for a baby shower, a support ribbon for a fundraising event, or a classic crane for any elegant affair. No matter what type of folds you choose for your napkins, coordinate with the rest of your table setting and accents such as place cards, favors, and centerpieces, and your table will be truly eye-catching.